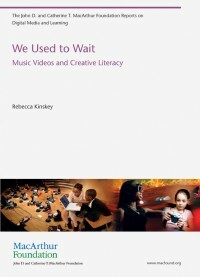 Kinskey offers a short history of the music video as a communicative, cultural form, describing the rise and fall of MTV’s Total Request Live and the music video’s resurgence on YouTube. She examines recent shifts in viewing and production practice, tracing the trajectory of music video director Hiro Murai from film student and dedicated amateur in the 1990s to music video professional in the 2000s. Investigating music video as a literacy, she looks at OMG! Cameras Everywhere, a nonprofit filmmaking summer camp run by a group of young music video directors. The OMG! campers and counselors provide a case study in how cultural producers across several generations have blurred the line between professional and amateur. Their everyday practices remake the notion of literacy, not only by their collaborative and often informal efforts to impart and achieve literacy but also by expanding the definition of what is considered a valuable activity, worthy of dedicated, pleasurable pursuit. Rebecca Kinskey is a writer and video producer in Los Angeles.